In the structure of character arcs, the First Half of the Second Act is where your character ventures (or is thrust) into uncharted territory—and gets lost. He may not quite see it that way himself, but this is where he begins to discover that the old rules (the Lie He Believes) no longer apply. This puts him in a bit of a tailspin. He scrambles to react to the events of the First Plot Point, while chasing as hard as ever after the Thing He Wants. He’s reactive in the sense that he’s at the mercy of the antagonistic force; he is not in control of the conflict. But don’t confuse reactivity with passivity. Your character will be very active in his pursuit of his goals during this time, and he’ll be learning which methods of achieving that goal are ineffective. This new knowledge will, in turn, lay the groundwork for helping him begin to realize how his belief in the Lie is holding him back. 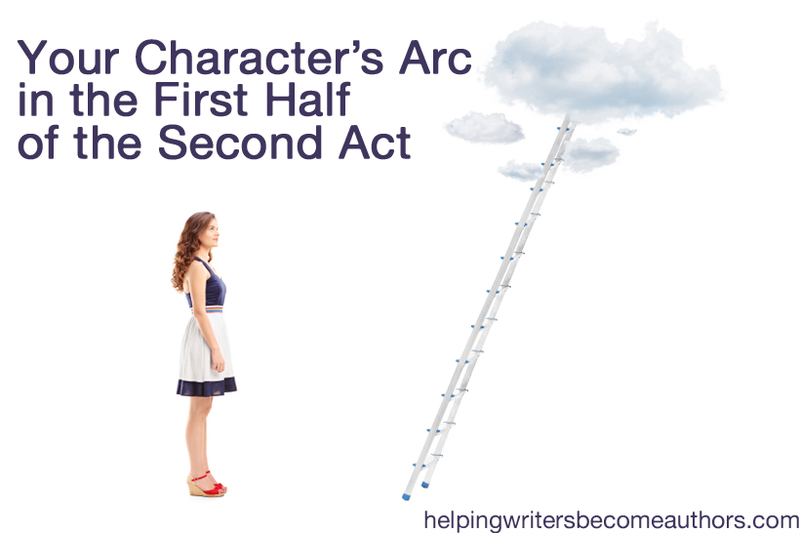 The First Half of the Second Act is where your characters react to the First Plot Point. The First Half of the Second Act shows your character trying to regain his balance and figure out how to survive in this new world in which he finds himself. The First Half of the Second Act features a Pinch Point (at the 3/8th mark), in which the antagonist flexes his muscles and reminds readers what the protagonist is up against. The First Half of the Second Act begins immediately after the First Plot Point and will continue until the Midpoint at the 50% mark. Speaking generally, you can divide your book into two halves. The first half is about the character reacting to events; the second is about him taking action. This is nowhere clearer than in the First Half of the Second Act, as the true burden of the character’s Lie finally begins to emerge. As you structure your character’s arc in the First Half of the Second Act, be sure to incorporate the following four landmarks. There is no firm timing for any of these; as long as they take place before the Midpoint, you’ll have everything in place for the next big turning point in your character’s development. After the First Plot Point shakes up your character’s Normal World, he’s going to be in a vulnerable state. And that means he’s primed to receive help in overcoming his Lie. He won’t be given all the tools yet, but he will receive at least a nail. He receives one piece of the puzzle. Or we might think of it as the first rung into the ladder he will use to scale the wall of the Lie. This first tool will come in the form of information on how to overcome the Lie. Often, it will result from another character (often a mentor or guardian archetype) offering advice. The First Half of the Second Act is frequently where the protagonist will spend time training or learning the skills necessary to battle the antagonist in the Climax. At the same time he’s learning necessary physical skills, he should also be learning Truths to combat his Lie. Keep your words visual. It’s easy to [write a scene] that sounds right, but the next morning it becomes obvious that you’re not describing a physical action or visual behavior, but a mental attitude. Attitudes are okay to begin with, but before you go much further, you must come up with an action the audience can see. As of the First Plot Point, the world around the protagonist has changed. But he still hasn’t caught up. The light of Truth may be glimmering at the edge of his vision, but he isn’t consciously aware of it yet. He has yet to even recognize there is a Lie to overcome. He’s still trying to pursue business as usual. He’s reacting to new events in the same ol’ way—and it’s not working. …the character will fail without understanding why—perhaps she denies the problem exists. …during Act 2A a character’s Behavior Before traits [actions and attitudes based on the Lie] become more difficult for that character to embrace and initiate. This challenge to his practiced vice sets the character up to consider a different method that the Moment of Grace [Midpoint] will offer. For example, after Thor finds himself banished to Earth, his old attitude as an arrogant immortal has him attempting to muscle his way to authority—and failing in a variety of humiliating ways (getting tasered, sedated, and run over). At this point, the character is still hellbent on getting his hands on the Thing He Wants. He’s convinced it’s going to solve all his problems, and he desires it with a single-minded fanaticism. What he doesn’t realize as he races toward his goal is that the closer he gets to the Thing He Wants, the farther it’s pushing him away from the Thing He Needs, if only because he believes the Thing He Wants negates the necessity for the Thing He Needs. Despite the problems engendered by his faulty, Lie-based methods, your character will still make definite progress toward his goal in this section. In Jon Turteltaub’s The Kid, Russ seems to have gotten rid of his young doppelganger. In Pete Docter’s Monsters, Inc., Sully and Mike have a plan for sending Boo home. In Ernest Cline’s Ready Player One, Wade is leading the scoreboard and winning the girl. But these seeming advances are just whitewash on top of worm-eaten wood. These surface victories are blinding the character to the true nature of his inner conflict. The lure of the Thing He Wants is pulling him toward his destruction. He may be on his way winning the outer conflict, but, if he keeps heading down this path, he’s destined to lose his inner battle. In Three Kings, the characters find the gold, steal it, and head out of town. They’ve got what they want, but they’re leaving an entire village at the mercy of enemy soldiers, making them no better than the men they’ve risked their lives fighting. The First Plot Point sets up a brand-new scenario for the character—one in which he glimpses, for the first time, what life might be like without the Lie. This glimpse will probably result from a demonstration of other characters’ actions and attitudes, but it could also come thanks to the character momentarily shedding his Lie and getting a hint of the reward of Truth. At this early stage in the story, the character shouldn’t get much more than a glimpse. He’s not ready to be convinced of the faulty premise of his Lie. But he should begin to see the cracks. There’s life beyond the Lie, and it’s a pretty awesome life. He needs to be given just the smallest sense of how great it would feel to cast aside the Lie and never look back. In Green Street Hooligans, Matt fights alongside his brother-in-law’s football firm and learns, for the first time, how good it feels to fight back when someone pushes you around. A Christmas Carol by Charles Dickens: The three spirits are all about providing Scrooge with tools to overcome his Lie. The Ghost of Christmas Past walks him through his history, reminding him of wonderful memories of his young manhood working at Old Fezziwig’s. The ghost gets Scrooge to admit that Fezziwig’s kindness made Fezziwig a bigger man than any amount of money could have. The ghost then shows Scrooge a glimpse of what his life might have been had he rejected the Lie from the outset and married Belle. Scrooge resists the revelations and wrestles with the ghost, only to have it dump him back in his house—and the lap of another spirit. Cars directed by John Lasseter: Lightning McQueen receives tools from just about every character he meets in Radiator Springs. Mater and Miss Sally talk about how wonderful Radiator Springs is, with its friendly neighbors and leisurely pace of living. But he resists. He scares off their customers by trying to escape his community service sentence, and, as a result, Doc “punishes” him by challenging him to race—and beating him. Lightning tries to move toward the Thing He Wants and away from Radiator Springs by fixing the road as fast as possible. Throughout the First Half of the Second Act, the townsfolk keep showing him a world where people care for each other. The Truth is right in front of Lightning’s face, but he keeps resisting it, insisting it’s something that doesn’t even appeal to him. 1. How is your character reacting to the First Plot Point? 2. What “tools” can you provide to help your character build the first rung in the ladder that will scale his Lie? 3. What minor character can offer advice or exemplary behavior to help mentor your protagonist? 4. How can you show the character the first step in overcoming his Lie, instead of just telling him about it? 5. How will your character attempt to use his Lie to solve plot problems? 6. How will he be “punished” as a result? 7. How will these failures evolve your character’s outlook and tactics? 8. How will your character’s single-minded pursuit of his plot goal lead him closer to the Thing He Wants? 9. How will his pursuit of the Thing He Wants cause him to risk turning farther away from the Thing He Needs? 10. After the First Plot Point, how will the new world or the altered Normal World provide the character with a glimpse of how life might be without his Lie? During the First Half of the Second Act, your character will be more determined than ever to reach his plot goal. He’s trying very hard to take control of his life—and the conflict—and, on some levels, it totally seems to be working. On other levels, he’s messing up worse than ever. Use the First Half of the Second Act to explore the depths of your character’s personality, beliefs, and desires. The result is a well of endless possibilities for fun, conflict-powered scenes! Stay Tuned: Next week, we’ll be talking about your character’s arc in the Midpoint. Part 1: Can You Structure Character? Tell me your opinion: How is your character’s Lie-driven behavior causing him to fail in the First Half of the Second Act? Heyya! Thanks for another great post. I’m just trough this part on my wip so this comes in really handy! Aaah! I was so excited to get the email for this post this afternoon! Thank you for another great post! =) Coming up with enough ‘meat’ for a full quarter of the story can be hard, but I think with just a bit of structure it’s very much possible. So much has to go into it…I feel like when I finally do start drafting, it will be very hard to keep it from going over a quarter! Thanks again for the amazing post! Structure – of both plot and character – is a great way to find guidance for tricky parts of the story. Whenever we’re unsure what to write, we can refer to the structural precepts and check to see that our characters are on the right course. I’m loving this series! It’s helping me so much in planning out my next project. Question: can this same structuring method, these same questions, be used for my secondary characters? Or do they require a different approach? They can definitely be used for secondary characters, just as they can for main characters. Not all secondary characters will experience major arcs, but some definitely do. The important thing to keep in mind is that all arcs within a story should be complementary to one another in relation to the theme. KM, thanks for this helpful post. I read your book on structure and really found it useful. I believe the second act is where most writers–including me–get bogged down. They’ve set up the story and written the inciting incident and then they don’t have enough dramatic action scenes to sustain the story until the climax. This can be cured by a vigorous outlining process that forces the writer to work out these problems before writing the first draft. Alas, I am a pantser but I do see the value of outlining and am working toward doing it in future WIPs. These are some helpful tips. Thanks again. Part of the problem is that the Second Act is such a vast part of the book, and, as such, its requirements are spread out over a greater time period than those of the First or Third Acts. But when we really start breaking down the plot and character structures, we can see that the Second Act is just as rich in necessary story moments as any other part of the story. Thank you for commenting on my blog. I enjoy your blog very much. I have a lot of the content you recommend, and I have this book. It has been very helpful and insightful. I’m so glad you’ve found it useful! And thanks for mentioning me in your post. Hi again KM, finding these blogs very helpful in structuring my story (and it’s nice to see that for the most part my intuition has already structured the story in a mostly efficient way) although there are elements where I am wondering if I can still apply this structure. As mentioned before my MC’s character has been kidnapped, and the first plot point was initially going to be the decision to take it upon themselves to find her (she’s family afterall) even though they don’t get on – the idea being that the love is there underneath everything that has been said and done. That is the crack in my character’s lie. But how can they continue to push forward to save their sister if they are also still clamouring to be independent and alone? Does the lie take a different form? To work independently and find her without any help from others? Your guidance and opinion would be greatly appreciated. Isn’t a writer’s intuition an amazing thing? Obviously without knowing the details of your story this could be inapplicable: but my take would be that you can easily set up an evolution of this Lie/Truth by having your protagonist trying to live by the Lie (he doesn’t need help) in the first half and having it hamper his ability to find his sister. Then after the Moment of Truth comes at the Midpoint, he begins shifting more and more into a understanding of the Truth–and using that Truth to be more effective (e.g., accepting the help of others) in the second half.